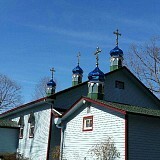 On Wednesday, December 19, the feast of the Holy Hierarch & Wonderworker Nicholas, Archbishop of Myra in Lycia, Eastern American Diocesan vicar Bishop Nicholas of Manhattan paid an archpastoral visit to St. Nicholas Church in Stratford, CT, where he celebrated Divine Liturgy for the parish's patronal feast day. It is deep autumn, and the palm leaves are bright green. But even the "greenery" in Fort Myers comes in many colors, because of the wide variety of palms not to be found anywhere else in Florida. That is even the city’s nickname: "City of Palms." On a snowy Monday morning, December 24, the annual St. Herman Youth Conference opened in Nativity of the Mother of God Church in Albany, NY. On Saturday the 15th and Sunday the 16th of December, Metropolitan Jonah (Paffhausen; former Primate of the Orthodox Church in America) paid an archpastoral visit to St. Alexander Nevsky Diocesan Cathedral in Howell, NJ, where he led the resurrectional divine services. Saturday the 24th and Sunday the 25th of November brought great joy to St. Nektarios parish in Lenoir City, TN, as the community welcomed the First Hierarch of the Russia Church Abroad – Metropolitan Hilarion of Eastern America & New York. 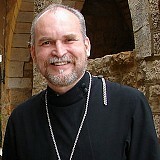 On Sunday, December 16, when the Holy Church celebrates the feast day of the Holy Prophet Zephaniah and Venerable Sabbas of Storozhi (Zvenigorod), the First Hierarch of the Russian Church Abroad, Metropolitan Hilarion of Eastern America & New York, celebrated Divine Liturgy in the Synodal Cathedral of the Sign in New York City. 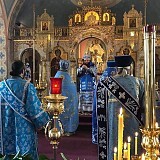 On Monday, December 10, festal Liturgy in the cathedral was celebrated by the First Hierarch of the Russian Church Abroad, Metropolitan Hilarion of Eastern America & New York. 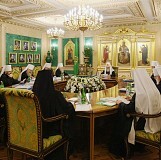 On Sunday, December 9, the feast day of the Holy Hierarch Innocent of Irkutsk, Apostle to Siberia & Alaska, and upon completion of the work of the ROCOR Synod of Bishops at the Synodal Headquarters, Metropolitan Hilarion of Eastern America & New York celebrated Divine Liturgy in the Synodal Cathedral of the Sign in New York City. On Sunday, December 2, His Grace George, Bishop of Canberra, paid an archpastoral visit to St. John the Baptist Cathedral in Mayfield, PA, where he celebrated Divine Liturgy. 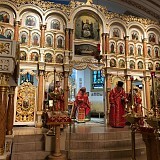 On Tuesday, December 4 – the great feast of the Entry into the Temple of the Most Holt Theotokos – the First Hierarch of the Russian Church Abroad, Metropolitan Hilarion of Eastern America & New York, celebrated Divine Liturgy in the Synodal Cathedral of the Sign in New York City. 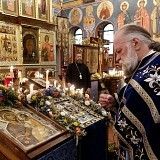 Over the course of nine days – November 21-30 – the Kursk Root Icon of the Mother of God, one of the most ancient holy icons of the Russian Orthodox Church (1295 A.D.) visited St. John the Baptist Cathedral in Washington, DC. On Sunday, December 2, when the Orthodox Church celebrates the memory of the Holy Prophet Obadiah and the Holy Hierarch Philaret, Metropolitan of Moscow, Metropolitan Hilarion of Eastern America & New York celebrated Divine Liturgy in the Synodal Cathedral of the Sign in New York City .